The Marbled Lungfish is very fascinating to look at, and unlike most of its relatives its coloring is also very attractive! The Marbled Lungfish Protopterus aethiopicus is an African Lungfish found in the Nile River as well as a number of lakes in Africa. Because of its spotted or marbled pattern, it’s easy to see why the name “Leopard Lungfish” is used for this variety of lungfish. Most of the other species of lungfish, although still interesting and worthwhile to keep, are relatively drab looking when compared to this species. Lungfish are members of the subclass Dipnoi, an ancient group of very primitive fish. Some consider this fish to be the oldest form of evolution on the planet. They have little "legs" and can somewhat walk on land and they can breath air. Fossil records show that these fish have stayed the same physically for millions of years. At one time these fish were widely distributed throughout all major land masses, but today are confined to central South America, central Africa, and eastern central Australia. In ancient times they were also found in saltwater but now they are only found in freshwater, which is the only known change to this fish. They are called "lungfish" because of their ability to extract oxygen from the atmosphere as well as water. The organs they use to do this are about as close to true lungs as any fish possesses. Their breathing apparatus is distinctly different from the types of auxiliary breathing apparatus found in anabantoids (the livebearing fishes) and other types of fish. This lung apparatus allows them to survive where the waters disappear completely during dry seasons. Marbled Lungfish live in streams and swamps that may dry up completely during the dry season. They can burrow down leaving a small hole for breathing. Mucous will form around its body to help seal in moisture. While in this state, its metabolism will decrease which allows it to survive for many months underground. When the rains come again, it will come out of the mud to resume its life as a fish. Here's an interesting story about these fish. In the wild the lungfish will dig into the mud and bury themselves before the dry season comes. They will then go into a near dead state. They can stay that way up to 3 to 4 years. Many homes are built from these same muds in Africa, and on many occasions there has been a lungfish in the muds the builders use. It is unnoticed, but when the heavy rains come these fish will wake up and break through the new homes wall and then walk their way back to the water! This is a curious looking fish that can make a great showpiece, but it will live a long time and eat a lot. Marbled Lungfish are easy to keep because they aren't very fussy about water conditions. They love to eat, and can even learn to take food from your hand. They do get good sized but are not really active fish, so most specimens will do fine in about a 60 gallon aquarium. However, these fish are usually kept alone. This is because, although they aren't really aggressive, they will eat most anything they can vacuum into their mouths. They have big mouths and a huge appetite. The Marbled Lungfish Protopterus aethiopicus is also known as the Leopard Lungfish. This is an African Lungfish species that and belongs to the Protopteridae Family of lungfish. This family consists of just a one genus, Protopterus, and this genus contains four species. The Protopterus aethiopicus species itself is comprised of three subspecies. All three subspecies of Marbled Lungfish Protopterus aethiopicus occur in Africa where they inhabit river and lake fringes, swamps and floodplains. The species is not listed on the IUCN Red List. Young Lungfish are typically found hiding in the shallows under matted roots. Their primary diet consists of mollusks, but fish and insects are also eaten in small quantities. This species was described by Heckel in 1851 and is found in the Nile River; and in Lakes Albert, Edward, Victoria, Nabugabo, Tanganyika, and Kyoga. This species was described by Poll in 1961 and is found in the Congo River basin. This species was also described by Poll in 1961, and is found in the Congo River basin as well. This species was described by W. K. H. Peters in 1844. This is the smallest lungfish species, reaching only about 24 inches (44 cm) in length. It is blue or slate gray color with small, hard to see black spots, and a pale gray underside. Its body is brown or olive with large brown or black spots and lighter on the underside, without the spots. This is a long, eel-like lungfish with a prominent snout, small eyes, three external gills, and 34 to 37 pairs of ribs. It reaches about 39 inches (100 cm) in length. Its fins are long and filamentous with a fringe at the base of the pectoral fins. West African Lungfish - Tana Lungfish This species was described by Owen in 1839. Southern Lungfish - This species was described by Poll in 1961. This species was described by Boulenger in 1900. It is found in the Kouilou-Niari Basin of the Republic of the Congo, Ogowe River basin in Gabon, and the lower and Middle Congo River Basins. It reaches about 51 inches (130 cm) in length and can aestivate on land by surrounding itself in a layer of dried mucus. Lungfish are an important source of food for many African tribes. Some will actually dig out their mud dens without disturbing the fish and wake them with water when they want fresh fish during the dry season. Many tribal woman do not eat these fish as they believe they are sister fish to them. Their flavor is quite strong and those that do eat them seem to be of two extreme opinions, either they highly favor the taste or they strongly dislike it. The body of the Marbled Lungfish is smooth, elongated, and cylindrical with deeply embedded scales. The tail is very long, becoming slender until it thinly tapers off at the end. The pectoral and pelvic fins are also very long and thin, almost spaghetti-like. The Protopterus aethiopicus aethiopicus can grow to over 6 feet in length, weighing over 25 pounds, and have a life span of 20 years. These fish have a yellowish gray or pinkish toned ground color with dark slate-gray splotches, creating a marbling or leopard effect over the body and fins. The color pattern is darker along the top and lighter below. There is also an albino color variety sometimes seen. The newly hatched young have branched external gills much like those of newts. After 2 to 3 months the young Leopard Lungfish transforms (called metamorphosis) into the adult form, loosing the external gills for gill openings. These African Lungfish are actually very easy to care for as long as you can offer the space it needs as it grows. These fish are long lived and can reach between 3 to 6 feet, depending on the subspecies. Their water requirements are very low and they will learn to eat right out of your hand. Since they are carnivores, the Marbled or Leopard Lungfish will eat all types of protein foods. They need meaty foods. 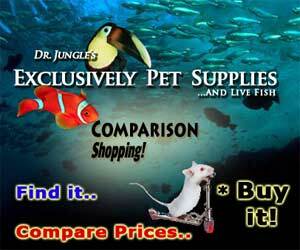 Provide live, fresh dead or frozen foods such as small fish, chunks of fish, earthworms, shrimp or crawfish. The easiest source of food is fish offered either live, dead or in pieces. The next easiest will be insects, shrimp, crayfish, clams or most any living animal that is not quick enough to escape their vacuum like mouth. Tongs can be used to hold food in front of them to make sure it is eaten quickly and then foods won't have a chance to foul the water. Young Lungfish will need to eat twice a day but as they mature this will change to 2 or 3 times per week. Tablet / Pellet: Yes - This fish may be trained to accept processed food but the aquarist should not count on it. Feeding Frequency: Daily - Young lungfish will eat twice a day and as they mature will eat 2-3 times per week. African Lungfish are large messy fish. A large high quality filter is needed to keep the tank clear. The do not require a lot of work, a bi-weekly water change of 30% would be fine if using a quality filter. Water Changes: Bi-weekly - Water changes of about 30% every other week. Marbled Lungfish are slow growers, but no matter which species you have, be prepared to eventually provide a home for a relatively large fish. This fish requires little swimming space, however it should be kept in an aquarium large enough for it to stretch completely out in. They are not particularly active so a 60 gallon tank should be big enough for most home grown specimens. Make sure to have a strong filter to keep the tank clean. This fish likes a muddy bottom and seems indifferent to how decorated the tank is. They like more subdued lighting and some places to hide. Ideally they like a fairly shallow tank, 12 inches (30 cm) is plenty, a muddy bottom, and some vegetation for security. This fish must be able to reach the surface to breathe. The aquarist should be sure the fish can reach the surface to breathe as this fish is one of the few that can drown without air. Make sure the water's surface is clear of obstructions. Other than when it is breathing, the Leopard Lungfish will spend most of its time on the bottom of the aquarium. This fish has very soft skin and could easily injure itself on jagged edges or rough gravel. Minimum Tank Size: 60 gal (227 L) - This fish requires little swimming space, however it should be kept in an aquarium large enough for it to stretch completely out in. Substrate Type: Sand - This fish has very soft skin and could easily injure itself on rough gravel. Range ph: - No exact values have been established and it appears to be tolerant of a wide range of conditions. Hardness Range: - No exact values have been established and it appears to be tolerant of a wide range of conditions. Water Region: Bottom - It will occasionally venture to the surface for air, but will spend most of its time on the bottom. This fish is best kept alone. This is because it is too slow to compete with other species for food, but especially because it will most likely try to eat any other animals kept in the same tank with it, including other lungfish. The Marbled Lungfish aren't aggressive but may try to eat anything that will fit into their mouths. Other large fish may survive in the tank with them, but there is always the chance that the lungfish may attack or be attacked by other fish. In the case of the lungfish, this will not be caused by aggression but by hunger. Temperament: Semi-aggressive - This fish is probably best housed alone. It will attack any fish it deems edible. It is also slow moving and soft skinned, making it an excellent target for other fish. The Marbled Lungfish has not been bred in captivity. In the wild, spawning generally occurs in the rainy season. These fish practice external fertilization. The eggs are laid in muddy deep holes and guarded by the male even after hatching into larvae. During breeding the males develop structures in their pelvis that they use to filter gases in the air and use this to increase oxygen levels in the nest. The young (larvae stage) breath through branched external gills much like those of newts. After 2 to 3 months the young transform (called metamorphosis) into the adult form, loosing the external gills for gill openings. 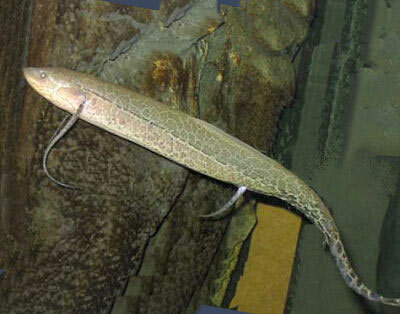 African Lungfish are hardy fish when mature, but are subject to the same diseases as other tropical fish. One of the most common freshwater fish ailments is ich. Anything you add to your tank has the possibility of bringing disease to your tank. Not only other fish but plants, substrate, and decorations can harbor bacteria. Take great care and make sure to properly clean or quarantine anything that you add to an established tank so not to upset the balance. With the Leopard Lungfish disease is not usually a problem in a well maintained aquarium. That being said there is no guarantee that you won't have to deal with health problems or disease. The best way to proactively prevent disease is to give your African Lungfish the proper environment and give them a well balanced diet. The closer to their natural habitat the less stress the fish will have, making them healthier and happy. A stressed fish is more likely to acquire disease. Lungfish are very resilient once established in a tank. Knowing the signs of illness, and catching and treating them early makes a huge difference. It is recommended to read up on the common tank diseases. For information about freshwater fish diseases and illnesses, see Aquarium Fish Diseases and Treatments. The Marbled Lungfish, also called the Leopard Lungfish, are commonly available but the price will most likely be high. It is definitely a candidate for a special order. There is also an albino variety sometimes available, called the Albino Marbled Lungfish or Albino Leopard Lungfish. There are at least 3 subspecies of Protopterus aethiopicus and although all are similar, there are some significant differences, especially where maximum size is concerned. The species most likely to show up for sale is Protopterus aethiopicus congicus. The fish featured here may be Protopterus a. congicus although it’s difficult to be 100% sure without knowing where it was collected. I have a small marbled lungfish about 10', but it got attacked by my Terrapin which is about the same size, maybe larger. The fish got two of its 'legs' bitten off halfway, along with the tip of its tail. Mine is an P. A. Congicus, and I have two blood parrots and a short-body oscar in my pond along with a 10-year old red-eared slider. What would you recommend I do with my lungfish? Will the 'legs' and the tail grow back and what medication should I use for him? And at which size would he be safe to return to the pond? The blood parrots and the oscar usually stay at mid-surface level, so they most likely would not be attacked by the lungfish. Can i keep one of these in a 55 gallon with:2 african brown knife fish,1 trinidad pleco,6 weather loach,1 rainbow shark,and a peacock eel? I think it is best not too. you can learn more info at marbled lungfish, social behaviors. tiger oscar , you are right on! Knife Fish Lover, you really need to read the information provided on all the fish you have been asking about. The answers are usually on each species page. That will be really cool, and the electric catfish are very unique too. I am a researcher interested in lung fish genetics. I am new to the fish world and have mostly worked with Zebra fish and tilapia. I am told by a colleague that it is difficult to tell physically a male from a female lungfish in the early stages. Anyone have and know male and know female specimens and is willing to send me specimens for DNA analysis? What an interesting endeavor. I wish we could help, but have no specimens. However, we would love to hear what you learn as you proceed, and we wish you all the best! I am super interested in the Protopterus genus, However I only have a spare forty gallon breeder. what I want to know if that is fine for a juvenile while I save for a larger aquairium. These fish need little swimming area so that tank will last for a bit.